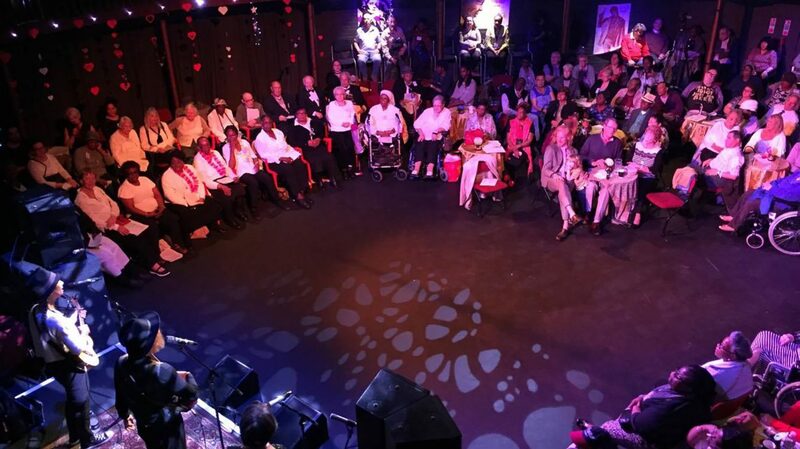 In 2013 Entelechy Arts and the Albany, in partnership with Lewisham Council, established an all-day arts club for isolated older people called Meet Me at the Albany. 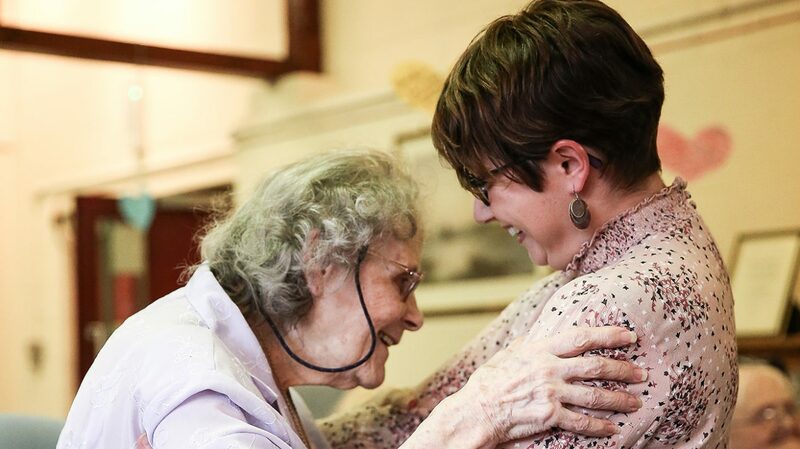 One day a week for fifty weeks a year, formerly lonely older people meet in the heart of the Albany building to work alongside artists and have the opportunity to uncover the artist within themselves. 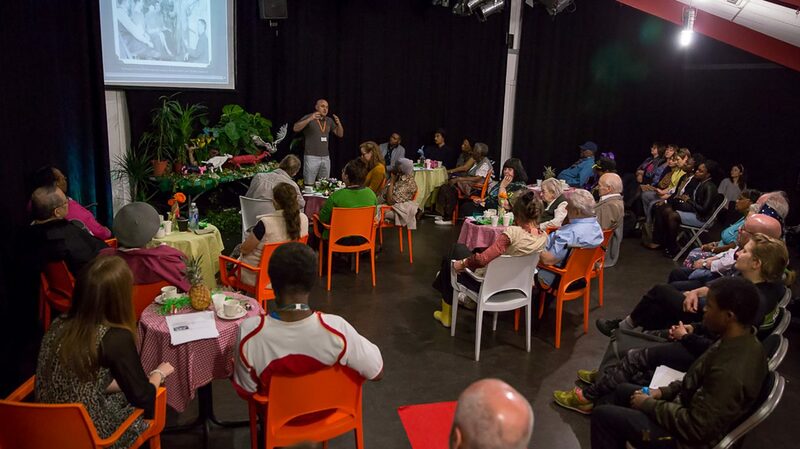 Participants are just as likely to be suspended on silks in a circus workshop, enjoying a performance of jazz, creating sculpture, writing poetry or singing in the weekly choir. Since 2013 the project has grown far beyond the weekly club. We work in partnership with Lewisham Homes running creative sessions for residents in a number of their Independent Living Schemes across the borough and we’ve created poetry exhibitions and mini-gigs with residents. There’s a film club: Meet Me at the Movies where we have cinema screenings for and chosen by older people. For cultural destinations there is Meet Me on the Move: monthly trips across London, from the Houses of Parliament to the Royal Festival Hall. 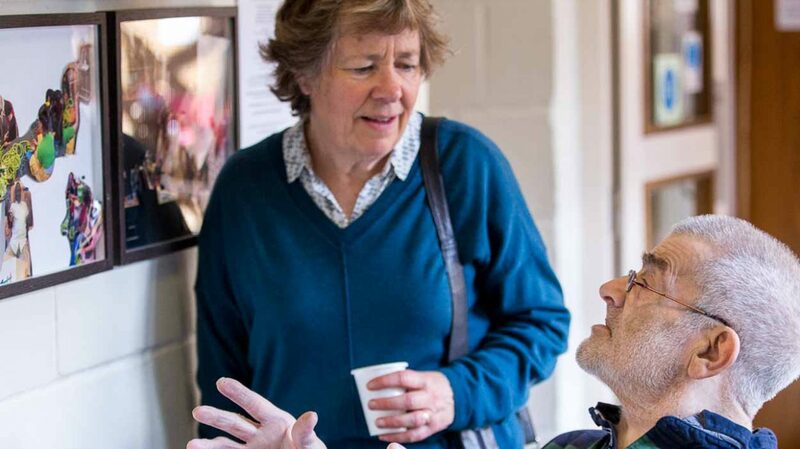 Befriending plays an important role within the wider Meet Me… programme. 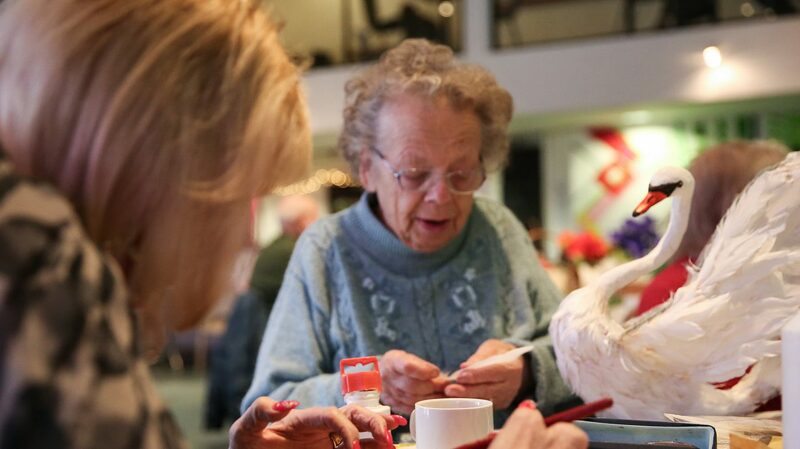 It supports volunteers to connect with isolated older people and introduce them creative activities. The volunteers develop skills to work alongside Meet Me Members who may be in need of someone to listen and provide support. With Meet Me Round Yours we are experimenting with ways of working with participants who are no longer able to get out on a regular basis. We are connecting with specially designed individual projects increasingly involving the use of technology to create ways to communicate. 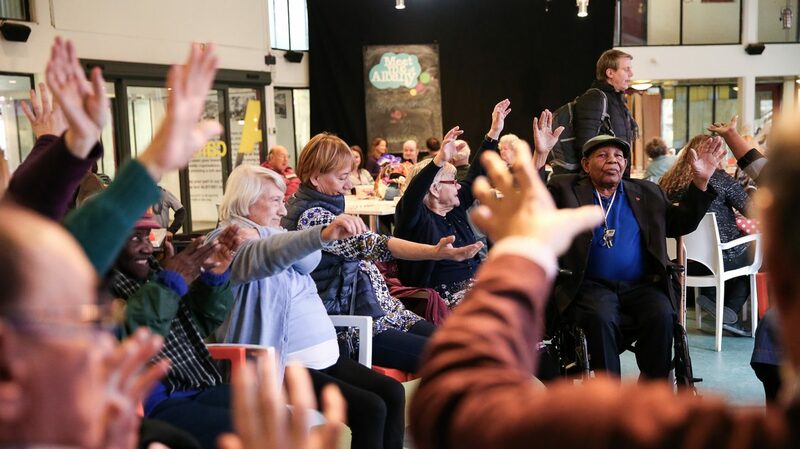 The programme continues to grow: next we will bring Dementia Friendly screenings and other activities to the South of the borough, following a successful Meet Me At… pop-up in Forest Hill. Coming to Meet Me has given me the confidence to take back control of my destiny. It’s given me a new zest for life and a new determination that I can do things for myself if I try. I’m a different person, more able, more confident. 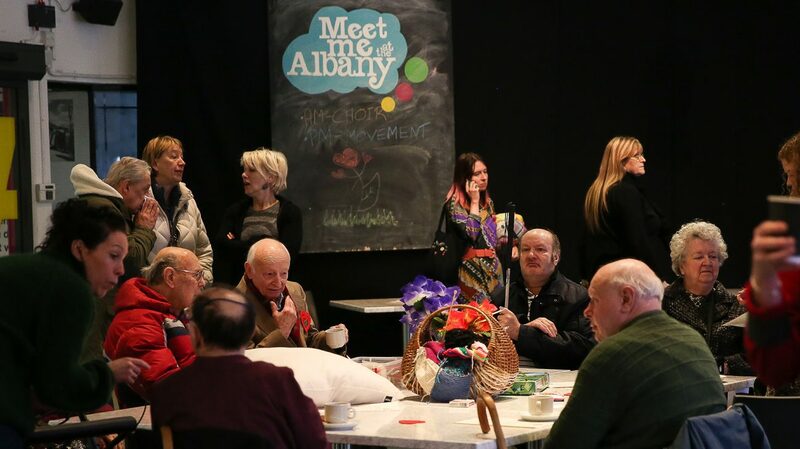 Meet Me at the Albany is an inspirational example of how participation in the arts can make a real difference to our personal and social wellbeing. Find out more about Entelechy Arts on their website via this link.  Find out more about Lewisham Homes on their website via this link. Top image shows the Meet Me At the Albany choir warming-up. Photo Roswitha Chesher. Meet Me At Lewisham Homes exhibition. Photo by Roswitha Chesher. Meet Me At Lewisham Homes Christmas Party. Photo by Roswitha Chesher. Meet Me At The Movies. Photo by Roswitha Chesher. Meet Me At the Albany member with some of her artwork. Meet Me At the Albany in the Albany café. Photo by Roswitha Chesher. Meet Me At in the Albany session in the Albany café. Photo by Roswitha Chesher. A 21st Century Tea Dance. Photo by Roswitha Chesher. 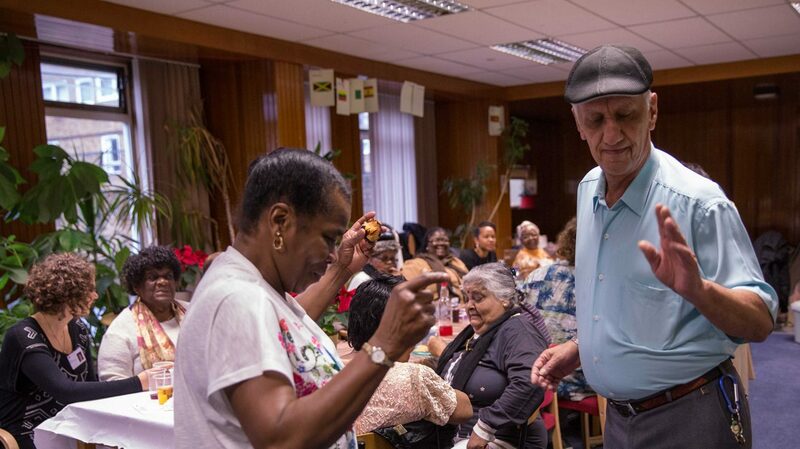 Dancing at a Meet Me At Lewisham Homes session. Photo Roswitha Chesher. 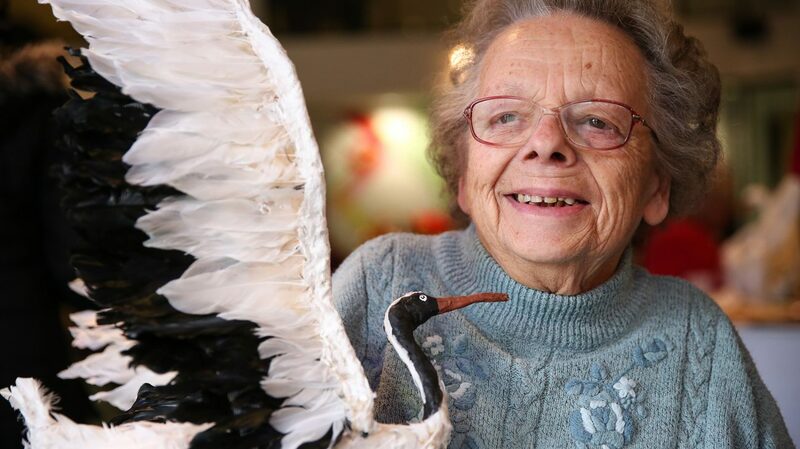 The Albany is lead producer for Lewisham's first Festival of Creative Ageing. Lewisham received an Impact Award of £216k for the festival as part of the Mayor of London’s Borough of Culture, funding.